1 Trim fennel, rinse and quarter. Remove core and cut the fennel bulb into small pieces. Chop the leaves. In a saucepan, heat the butter, add fennel bulb, sauté briefly, dust with the flour and pour in the wine. Gradually add the vegetable broth, whisking vigorously so that no lumps form. 2 Add salt, pepper and nutmeg and simmer for 10-15 minutes over medium heat. Grate 200 grams (approximately 7 ounces) of cheese, stir into soup and season again. Dice the remaining cheese and mix into the soup. 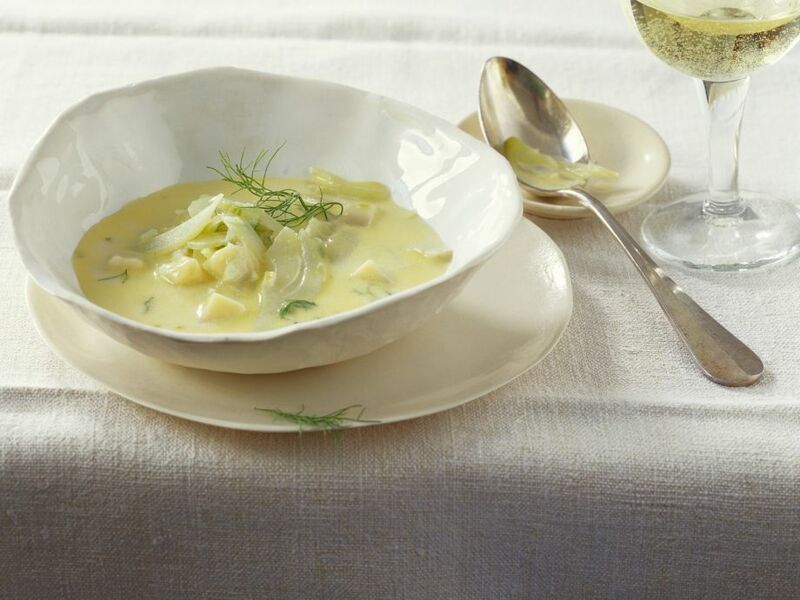 Place the soup in soup bowls and serve sprinkled with fennel leaves.